Black Hat SEO techniques for Search Engine optimization are very dangerous. Some SEO quacks mislead people promising an immediate rise in rankings and a sudden burst of traffic. All for a way lower price compared to what other SEO service professionals might be charging. This is sounds like a deal too good to be true! Let us say a fast and cheap SEO campaign is causing a huge amount of traffic to come to your website. You are happy with your SEO services marketing professional. Let us say a few months or a couple of years down the line you find your website has a sudden drop in rankings or may even be banned from Google SERP Listings. Was getting a cheap deal worth it ? SEO requires time and creativity. It requires patience and a deep understanding of your client’s business and their customers. SEO is not about creating a few backlinks or optimizing a few pages. SEO is about more than just trying to make a search engine show you at the top of the list. You will see often that you land up at website which are just packing long lists of keywords. Just stuffing your website with keywords and nothing else will eventually get your website penalized. Google, Yahoo,Bing and other search engines have grown very smart and now can detect keyword stuffing very easily. An experienced Search Engine Optimization Expert will know how to find and place keywords and phrases the right way on your Web site. A very old technique from the early days of internet search engines and SEO services is putting lists of keywords in white text on a white background. Or similarly the text matches the background colour. This is done in the hope of fooling search engine spiders. This is a very amateurish attempt to attract searchers or search engine crawlers. Website crawlers can easily detect this spam and if detected you might not just find your ranking taking a dip but might also see yourself getting banned from Search Engine Results. Another old Black Hat SEO Technique is using doorway pages. These are basically ‘fake pages’ that are not designed for users to see. These pages are designed mainly for search engine spiders in an attempt to trick them into indexing the website higher. Today Google and Other search engines also rank a page based on how many pages in your website are linking to this particular page. As such it will not of much practical use for a Search Engine Optimization company to implement doorway pages. There are 2 Meta TAGs that are of importance to Search Engine Optimization process. But they are so heavily misused that you can call them a Black Hat SEO Technique. The meta description contains the description of the content of your page. The description should be honest and concise. Try a maximum of 1 or 2 sentences, 3 at most. Do not try to stuff all your keywords into the Description Tag. The meta keyword TAG has lost importance due to rampant misuse by ‘SEO Experts’ from the Black Hat Domain. The TAG was created to have a list of keywords that helps search engines understand the content on your page. It should not list the keywords for your entire website. As remember, Google and any other search engine is ranking your page not the entire website. So the description should be relevant to your page. Enough of what we should NOT do. If Black Hat is bad then White Hat sure is good. 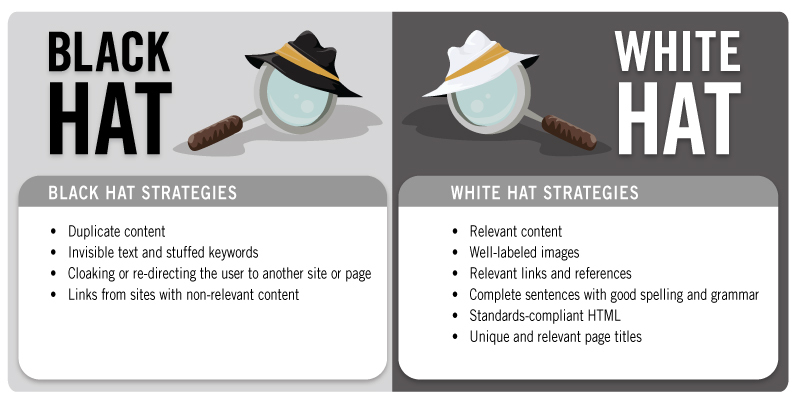 White HAT SEO is the technique used by the good guys of the SEO Business. The Things that you SHOULD do when it comes to SEO for your website. Content they say is King. And Google sure believes that. Google has modified it’s algorithm to understand good content and filter out the bad/duplicate content. SO what really is BAD Content ? Anything that makes the visitor believe he has wasted his time/has been misled to visit your website. Simple example is copying content from your competitors website and pasting the same on your website. The question to be asked is , does it help the visitor really understand your business and are you offering anything that others are not ? Confused ? Simply put it helps the search engine understand your content easily. You user tools like header TAGs, P TAGs etc. And mixing this with wise use of CSS in your website will make your important content stand out to the search engines while being visually appealing to the visitors. Wait .. .Was this not in the Black Hat Techniques ? Yes it was. The misuse of META Tags by the Black Hat Guys does not make it an unnecessary technique. Infact while the importance of meta tags and meta data is debatable it sure does hold importance. Do not ignore this. Just ensure that it is implemented wisely. An Expert SEO will know how to optimize meta tags for Search Engines. How to get Great inbound links ? Lot of amateur SEO’s believe that just getting some inbound links will help you rise in rankings. If it were so Google would be ruled by the people piling junk backlinks, thankfully it is not the case. Great content ensures Great Backlinks. Mix this with good White HAT backlink Techniques for astounding results. Secret to Success on Google is to go with a quality SEO Expert. An honest SEO Expert in White Hat Techniques might be costly but it will help you stay on top of rankings for a long time to come. Go, Choose wisely and Rule your Keyword! Contact SEO Services Experts Now!